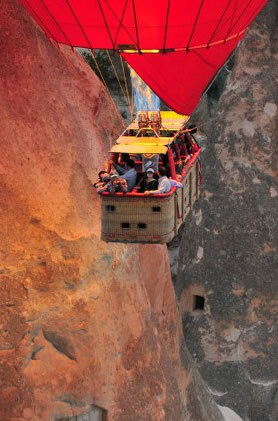 At this time of year, Cappadocia, in the heart of Central Anatolia, is absolutely heaving with visitors. There may be hundreds of hotels and pensions to choose from, but people arriving without reservations may still struggle to find somewhere to stay. But let’s assume you’ve already made a booking. How should you spend your time, given that Cappadocia is vast, covering most of the area between Aksaray to the west, Kayseri to the east and Niğde to the south? The following are our top tips for making the most of a visit to Cappadocia, but it’s by no means an exhaustive list. The number one must-see attraction is the Göreme Open Air Museum, where a group of rock-cut, frescoed churches dating mainly from the 9th to the 11th centuries are grouped together to form a monastic complex complete with refectories and fine rock-cut dining tables. In August the biggest drawback is the crowds, which mean that visits to the individual churches are restricted to five minutes, barely enough time to appreciate them. An extra admission fee to the magnificent Karanlık Kilise (Dark Church) helps keep the crowds at bay; unfortunately, the almost equally magnificent Tokalı Kilise (Buckle Church) outside the main gate is closed for restoration. Plans to extend opening hours into the evening will certainly ease pressure on the site, but if one look at the car park is enough to put you off, head uphill for the much less visited Aynalı Kilise (Mirror Church) off the road towards Ortahisar instead. Even if you usually hate signing up for a tour, the locally organized day trips to the Ihlara Gorge are well worth taking since they get you to several major sites that are time-consuming to reach by public transport. Star attraction is the dramatic 16-kilometer-long Ihlara Gorge, with the Melendiz River running along its bottom and rock-cut churches (and a newly discovered mosque) cut into its walls. Trekking the length of the gorge is a particular treat, but the day trips stick with a walk of three to five kilometers followed by lunch in a riverside restaurant, with a visit to the dramatic, rock-cut Selime Monastery for afters. Most tours call in at one of the underground cities and a panoramic viewpoint or two along the way. More than 100 underground “cities” where early medieval Christians took refuge from Arab invaders have been discovered in the Cappadocia area, but the one at Derinkuyu is the deepest and tends to attract the biggest crowds. If you think that might bother you in a confined space, nearby Kaymaklı is also very popular, but you’ll find fewer visitors at Özluce, Özkonak, Mazıköy and Gaziemir. There’s even a newly opened underground city at Talas in Kayseri. The name is a bit of a misnomer, since anyone who’s ever ventured into one of these “cities” will know that they are far too claustrophobia-inducing for people to have stayed inside them for any length of time. Although they’re clearly set up for daily life, with kitchens, stables, wineries and even a school in one of them, most would probably have been evacuated at speed as soon as the all-clear was sounded. It’s well worth visiting Uçhisar Castle, an enormous plug of rock that dominates the landscape for kilometers around and which once served as an early tenement block, with living space for families carved all the way up to the top. The view from the castle summit down the Pigeon Valley to Göreme is unforgettable. Cappadocia’s second open-air museum at Zelve gets far fewer visitors than its Göreme counterpart. Although there are a couple of rock-cut churches here too, none have frescoes to match those in Göreme. Instead, this is a place to come to amble through three adjoining valleys, which once formed a village until the residents were moved out in the 1950s for fear of possible rockfalls. 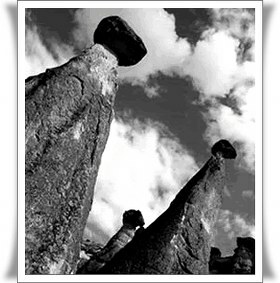 It’s a glorious location, a place to come and dream about the troglodytic past. On the way back you can also take a quick stroll around the striking fairy chimneys at Paşabağ (“the Pasha’s Vineyard”), looking out as you go for the local police station housed, appropriately enough, in a cone. On the western side of Cappadocia, Güzelyurt is a lovely small town that boasts all the features that have made the area so famous: a beautiful valley full of little rock-cut churches, an underground city, grand old stone houses and a fine church that has been sensitively converted into a mosque. Use Güzelyurt as a base for visiting Ihlara if you’d like to spend longer in the valley. Mustafapaşa is not the easiest place to get to without your own car, although tours to the Soğanli Valley pass through it. For those who find Göreme, Üchisar and Ürgüp too touristy, Mustafapaşa remains for the time being something of a backwater. Here you can admire some of the magnificent stone houses with elaborate door and window frames that were built when this was the old Greek town of Sinasos, before the 1923 Turco-Greek population exchange. Here, too, you can visit the vast 19th-century church of Sts Helena and Constantine in the town center, as well as the older but newly restored rock-cut monastery of St Nicholas in the valley winding out from the back of town. No trip to Cappadocia would be complete without striking out into the wonderful valleys that surround Göreme, Çavuşin and Uçhisar in particular. Although waymarking has improved recently, some valley walks can still turn into quite an adventure, so you might want to sign up for a tour or hire one of the local walking guides. The joy of the valleys is that they are not only scenically magnificent but also dotted with rock-cut churches and sprinkled with abandoned pigeon-houses from the days when locals kept pigeons for their fertilizing manure. Hire a horse and you will be able to ride through the valleys in the style of Paul Lucas, the first westerner to explore them at the start of the 18th century. Some of the most spectacular fairy chimney rock formations lurk in the Zemi Valley, behind the Turist Hotel beside the road to Göreme Open Air Museum. If you don’t have time to take a longer walk, at least try to get here.